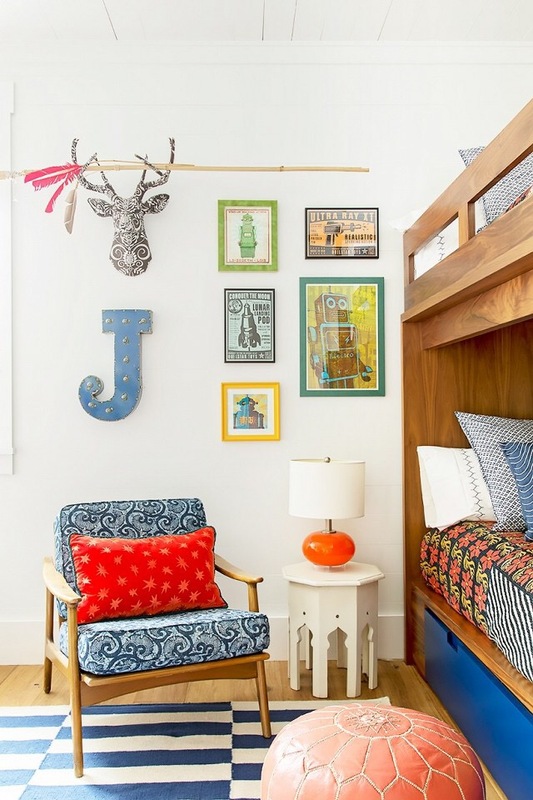 We have two rooms for the three boys: one big shared room and a small bedroom that was J’s nursery and is now our tween’s. The big room has been slow to come together. Little boys interests change so often, not to mention that they are tornadoes that leave a mess in their wake. I’m now ready to make a push to polish their space. As I discussed in this post on my steps for designing a room, and inspired by the Design Cookbook, here’s my recipe for the little boys’ room. I developed this recipe by collecting my favorite images on a Pinterest board. I’m looking forward to showing you the latest updates soon! I love having a camera on my phone, so I can snap a picture of beautiful things that cross my path. Here ate some the sights and vignettes that caught my eye recently. Love this throw pillow. It reminds me of the ribbon-bordered curtains I made for our bathroom. 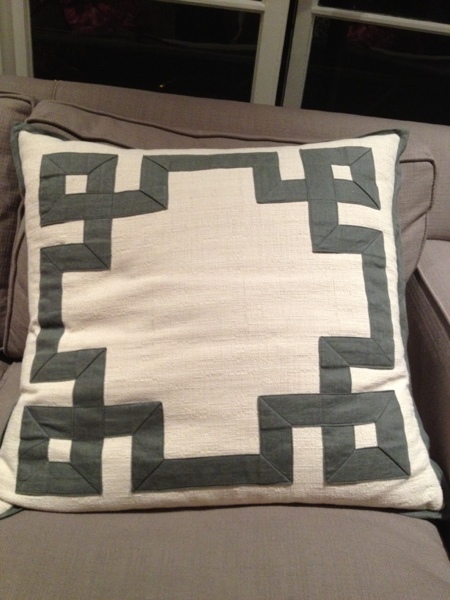 I would love to try doing this on some pillows for the bedroom. This is the window display at Plantation on Hayes St. in San Francisco. It is lucky that I usually walk by early in the morning, when they are closed, or we would be bankrupt by now! 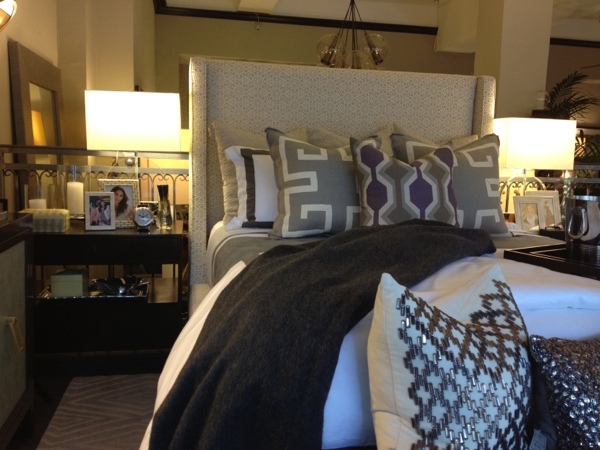 I love everything in this store, including the pillows and nightstand accessories on this bed. 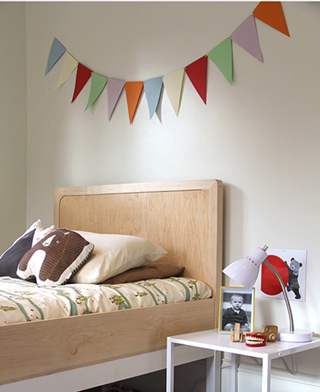 This will be my inspiration, as I work on my bedroom. I’m also on the lookout for some seating for our bedroom – a loveseat or a nice armchair and ottoman. 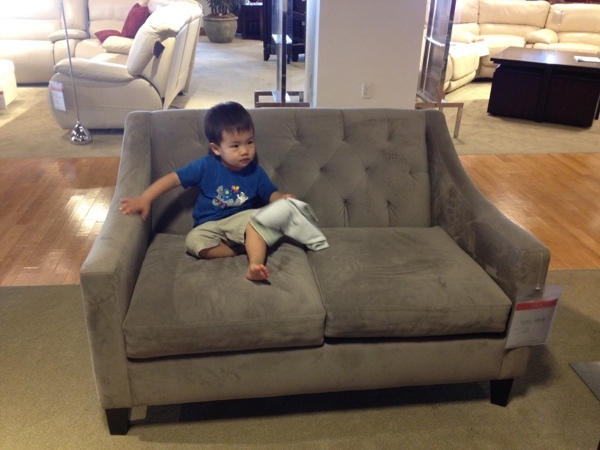 On the list is this Chloe loveseat (also comes in a chair) from Macy’s. I like the elegant classic look that is still comfortable. That’s our baby J modeling for me on the chair. Yes, he insisted on taking his shoes off in Macy’s. 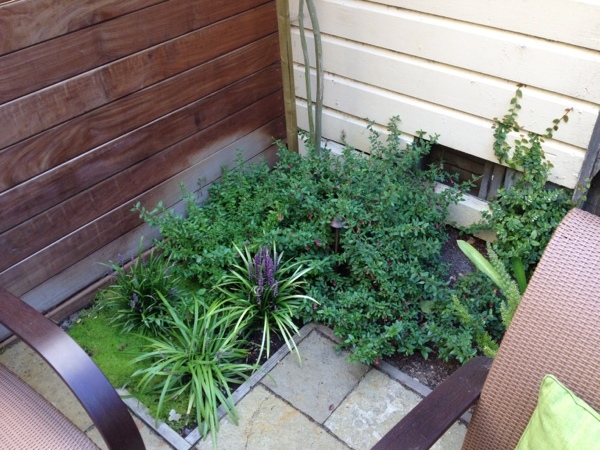 I frequently bemoan the lack of space and greenery in our back “yard.” I was lucky enough to go to an event recently at a lovely home in Laurel Heights, and I was inspired by the back patio, which is although small and paved over, still feels lush and inviting. I snapped some pictures for ideas when we get around to working on our patio! A little fountain makes the space so calming. 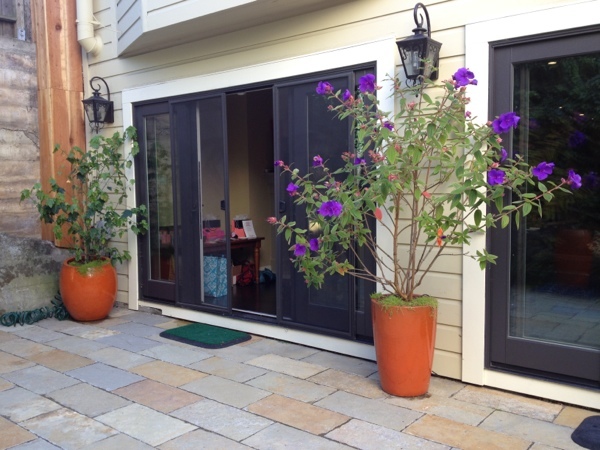 Potted trees add greenery to the patio. 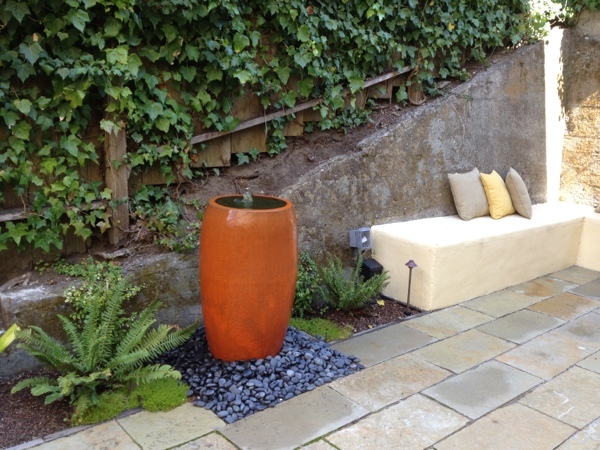 The warm colors in the stone pavers brighten up the space, too. 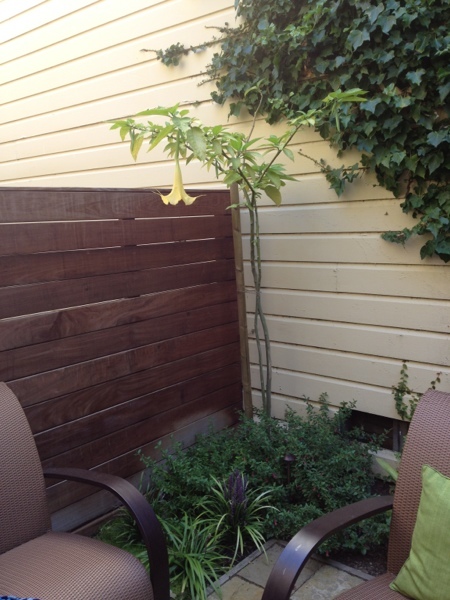 A little cut-out for plantings softens up the corner. 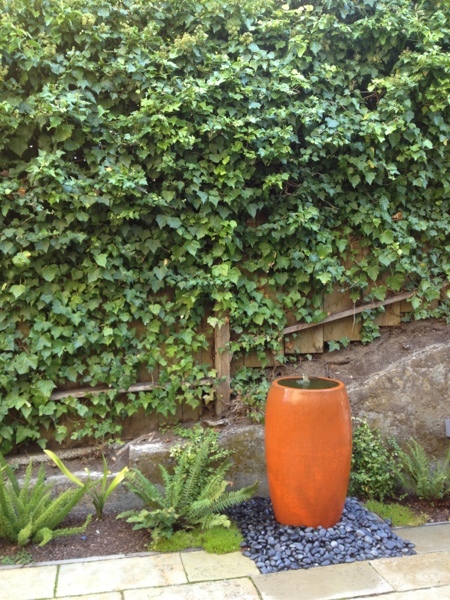 The vines growing up the wall are so lush. Beautiful fountain, river rock, and bench. Small trees in the corners give a sense of greenery and softness.